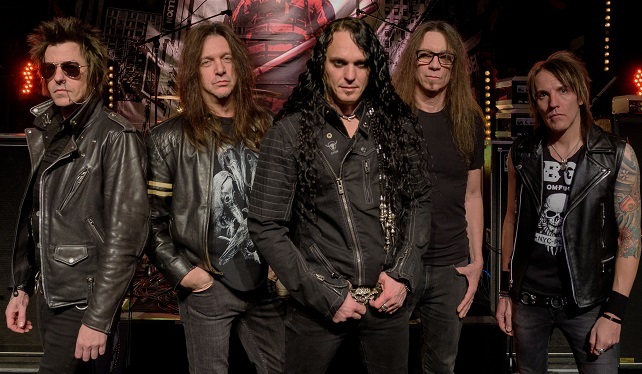 From Release: Skid Row started in 1986 when a group of New Jersey kids, armed with their punk and metal attitude, and a collection of riff-heavy, high-octane songs, set out to conquer the world, one concert at a time. This determined and focused approach proved to be an unquestionable success, as the group went on to clock up numerous Top Ten singles, Gold and multi-Platinum selling albums and a Number 1 on the Billboard album chart. In other words, the world was theirs. They might have conquered the world several times over, but Skid Row are focused on making more earth shattering music. Now, SKID ROW is gearing up to record the final instalment of the United World Rebellion trilogy. 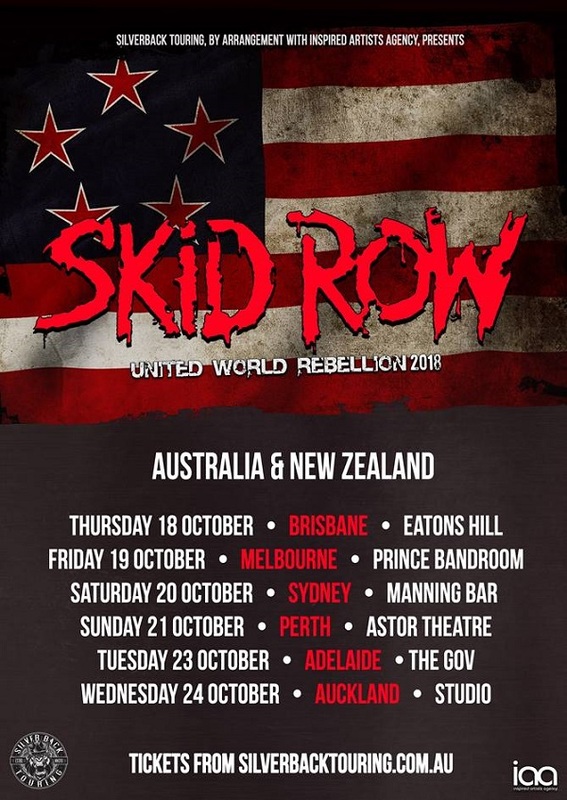 Of course the big news is you’re heading back to Australia this October, tell us how these shows will shape up and what a 2018 Skid Row show is all about? Well its funny we just having a conversation, ZP and I and how our show is so physical and I said ‘yeah, pretty physical for old guys’ *laughs* but you’re gonna hear all the songs you expect to hear and it’s not gonna be five guy staring at their shoes that’s for sure. We’re gonna put on the show as we do and it’s the first time we’re going to Australia with our new singer, well three years in ZP and we’re just looking really, really forward to it because Australia’s always been a lot of fun for us and it’s always been a really cool place because rock and roll is still so alive and well in Australia. So it’s something that as soon as we heard it was going to be on the calendar we all got pretty excited about it. You mentioned you’re also headed over with new singer ZP in tow, what has he injected into the band that you feel may have been missing previously? Consistency for one, and he brings such and aggressively positive feeling into the band that it rejuvenates everyone around him. He grew up listening to our stuff, he’s ten years younger than us but he knew our stuff pretty much better than we do *laughs* and it’s become a band you know what I mean? It’s not self-serving to anyone in the band, any time we’re in a room together it’s always about Skid Row and what can we do for Skid Row there’s never anyone with personal agendas and it’s a really good feeling and what a band should be you know. Chapter Three of the United World Rebellion is overdue but with good reason now that ZP is in, when can we expect to hear it? We’re hoping, it’s not gonna be this year we’re gonna start it this year, we’re actually starting pre-production in two weeks with Michael Wagener who’s gonna be producing it and it’ll be out probably sometime before summer time in 2019 and it will be a full length instead of an EP which we’re pretty psyched about. Oh man, Michael Wagener what a producer, love his work. Yeah me too, we’ve worked with him before obviously and he lives thirty minutes from me which is great because he’s one of my dearest friends. There’s always a couple of covers on these EP’s any scoop on what we may hear on Chapter 3? I don’t know, we have so many originals written that we may skip the cover thing but then again we may not. Covers are really fun to do and to take a song you’ve heard your whole life and record your take of it, your version is always really cool and we like staying true to what it is but we also like just to mess with it a little bit you know. We’re not sure yet we haven’t even crossed that bridge because getting five guys to agree on the same two songs *laughs* is not the easiest thing in the world. Covers for you goes way back to ‘B-Side Ourselves’ and no one was doing that back then so obviously it’s a cool, fun thing for you guys? It is, it’s always been fun. Always been really fun to do. As the primary songwriter in Skid Row, what for you has been the biggest challenge in writing music over three decades? I would say the biggest challenge is trying not to stray away from your roots because it just happens, life happens in between. I mean so much happens between each record but to go over thirty years and to retrace your steps is really difficult because you don’t want to just regurgitate and just write the same song a little differently, you don’t want to do that but you also want to stay true to who you are. We strayed a couple of times but I think we got back on track once we started recording the EP’s. So for me personally when I know we’re going to go into full on song writing mode I don’t listen to anything past 1978 *laughs* and I only listen to the stuff that influenced me to write the first record, I kinda without knowing that stuff just reinfleunces me again if that’s even a word ‘reinfluences’ and it just keeps me away from anything that might be current that I like you know and it kind of works because you just get back into that frame of mind that you were in when you wrote the records in the past. So next year your debut album turns thirty! Still one of the best debut rock releases ever in my opinion, what is your fondest memory of releasing that classic? The whole process of working with Michael (Wagener) was just amazing because that was the first time we ever worked with a real producer and someone of his calibre especially and I just remember things weren’t going right sometimes you just have those bad days and he’s like ‘ok’ and just starts shutting the lights off in the studio and says ‘come on we’re going jet skiing’ and we’ll go jet skiing and you’ll just let out all the cobwebs and whatnot and the next day you get back in there and you work and you’re like wow that’s really cool to do that and the recording process was cool, we were kids and just getting to do that with him he just made it really super easy and you never know what the record’s gonna do, you know what you want it to do, you know what your dreams are and your hopes but you never know what’s gonna happen. Then once it started happening big it was just like watching it happen to someone else because it all happened so fast and furious all the success and all the touring and we were twenty two / twenty three years old some of us it was pretty crazy, man, it was crazy times. Over time it’s easy to say what’s changed but what would you say is the one thing that’s stayed the same in your time making music with Skid Row? I think just wanting to do it, the want to go out and play, obviously member changes and whatnot but Scotti, Snake and I just love playing and we love going out, because there were talks of just retiring and riding off into the sunset, and we were all working on different projects at some point or another and we got to that point where we were like let’s just get this going again, we’ll do it a little different but let’s get this going again. There were highs and lows and since ZP joined the band we’re just on a huge high and the interest in the band has just reached different levels that it hasn’t been in years and that kind of stuff keeps you going when you reach new plateaus and you know you can keep going from there and you see stuff happening before your eyes but it’s good times, man. Looking back to your beginnings, was there one piece of advice you were given when you started making music that you still go back to to this day? Yeah, the guy who was our original manager through McGhee entertainment his name was Steven Pritchett and he has since passed but he gave me advice he said ‘this train doesn’t ride forever so make the most of and be smart with what you do. Be smart with whatever money you make’ and my parents instilled this into me too, they were like you know what we have all the faith in the world in you, be smart, my dad would always say as questions, invest your money, and make sure you take care of yourself for the future and those thankfully I listened, thankfully I wasn’t rebellious enough not to listen to a manger and my parents and that was a huge piece of advice, especially the asking questions, don’t be afraid to ask questions and that’s what I did and that’s pretty much how I learned the business of music is just by asking a tonne of questions, I don’t care if I was annoying people or not *laughs* I just asked a tonne of questions. On anniversaries, earlier this year was the 25th Anniversary of your shows in Australia with Guns N Roses, I was at the Calder Park show and you guys were unbelievable that day, what memories do you have of that tour? The biggest memory is when we rode in the stock cars over at the track, they gave us rides around the track in the race cars and the weirdest thing was going in the opposite direction *laughs* because I’m so used to Nascar and I’ve done stock car racing myself, I used to race go-carts back then but just going the opposite way on the track just feels so wrong *laughs*. That was really cool and that actually was the highlight for me was that, but getting over there and playing such big shows with Guns was cool, it was fun, and we made friends, I have friends that I made on the very first tour in ’89 that I’m still friends with today and we keep in close contact. For a kid from New Jersey going to the opposite side of the planet, like completely the opposite side of the planet and making friends and coming home and staying in contact and you know it was on regular house phones and pay phones we’d be ‘hey dude how you doin?’ that type of thing and we’re still friends thirty years later. That’s a big thing when you make a friend and you have a friend for life. I’m actually chatting to Ace Frehley in about twenty mins, you worked with Ace a while back on some of his solo material, what was that experience like working with a member of KISS? Oh cool. When we did the backups on his record it was pretty cool because we had met Ace in the studio and I knew Ace’s guitar player Richie Scarlet and had known him for years before that and we walk in and the added bonus was Peter Criss was sitting behind a drum kit just messing around and he got up and sang vocals and sixteen year old me was kinda flipping out at that point because I was standing between Ace and Peter singing backup vocals for Ace’s solo record *laughs* and I’m like is this really, really happening? Then we were lucky enough in 2000 to tour with KISS and I think I watched every show I only missed one because we had a double that night, we played a show with KISS and then went across town and did our own show. It was a great experience being such a huge KISS fan and that stuff happening it’s pretty amazing *laughs*. Now this is purely for me because I love it so much and it’s kinda the greatest musical thing ever, what do you remember about the Moscow Peace festival? Well I remember that we were being watched everywhere we went, and being on the same plane with all these people especially the flight there, being on the plane with Ozzy and his band, and of course Zakk is a Jersey guy we knew well and the Bon Jovi guys were friends of ours and Motley was there and wow there so many bands and then we stopped *laughs* we stopped in Germany to pick up The Scorpions which I though was hilarious, yeah the plane’s gonna stop like you’re pulling over to pick up a hitch hiker or something and The Scorpions get on, the Cinderella guys were there and it was just a really cool flight over and the gravity of the situation didn’t hit me until years later, it was like ‘wow we were in communist Russia playing in front of 70,000 people that probably only knew who Ozzy and The Scorpions were you know?’ and it was just a really, really cool piece of rock and roll history and I’m really proud to be part of it. Be around the world one more time and be working on a new record.